This is my second brew from Firestone Walker, another one from their Proprietors Reserve Series (thanks, ajcormier!). This is a nice-looking dark brew with a two fingers' worth of dense, creamy-looking tan head (capable of three-four, though, in later pours!). The lacing is fairly solid, but slowly lowers & follows the beer. It has a rather sweet aroma that is mostly of chocolate, with some fruity esters thrown in... somewhat like dark, melted chocolate & raspberries, without the tartness. There is a slight woody odour as well... like wet oak. Some roasted notes come out as it warms. The flavour is more of the same, but some more prominent roasted flavours come through, replacing pretty much any hints of fruit. The hops did not come through in the aroma much, but in the flavour and feel, they add some near-American pale ale / IPA qualities (most likely the Cascade hops at play) - some citrus-y pith was a possibly-out-of-place yet pleasant surprise. The carbonation is more tingly than expected, and its impression lasts / remains for a good little while, along with some bitterness. The hoppy bitterness comes through more than expected (which I liked). The body is medium and very smooth. I've been working through some porters and darker brews lately, and this one stands out among recent beers. I quite enjoyed its hoppy slants - they brightened it up and gave all of its aspects a boost that made it memorable. This is one of my favorite American Porters. The balance between the roasted malts and hops is done with absolute precision. 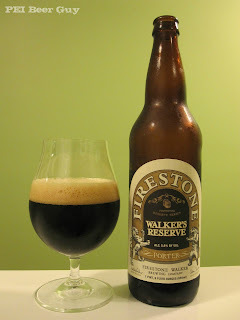 Firestone Walker is an amazing brewery.......if you have the opportunity to trade for Parabola or Abacus definitely jump on it. Also their anniversary is a blend of the proprietor's reserve series......this year's blend of the five beers is supposed to contain more double jack making it more hoppy than past versions.